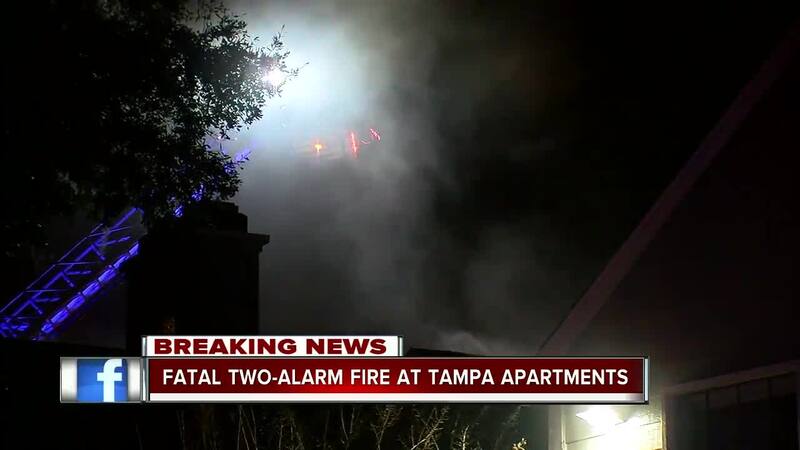 TAMPA, Fla. — A person was found dead by Hillsborough County Fire Rescue when they responded to a two-alarm fire at an apartment complex. Crews responded to 5536 Tranquility Drive at about 8:20 p.m. Saturday night. The victim was found dead in one of the two fully engulfed apartments. The cause of death and the cause of the fire are still unknown, authorities say. “Since the fire was in the stairwell there, the firefighters weren’t able to go up that stairwell so the way we were able to get entry is we put portable ladders up against the balconies here and made entrance into those apartments and then were able to fight the fire there and break through to the other apartments to fire the fire as well,” Eric Seidel with Hillsborough County Fire Rescue said.